At 96five our goal is to be the preferred radio station for families and that’s why we guarantee 100% family friendly radio… it’s our promise to families and that’s what makes 96five so different. So what does Family Friendly mean? It means you’ll never hear rude lyrics or innuendo in any of the songs we play, our announcers are all friendly and you won’t hear any ‘questionable’ language, crude jokes or negativity, anytime, day or night. On the other hand, you will hear great family tips and advice, positive music, information about family friendly events around Brisbane and an uncompromising message of hope. 96five has a dedicated team of staff and volunteers who all share these same values and are committed to making a positive difference in Brisbane. 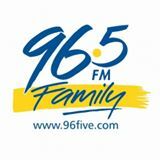 If you’d like to find out more about 96five, or you have some feedback, we’d love to hear from you 96five Family FM radio.